The hip is one of the most commonly replaced joints. The hip is a ball and socket joint. It allows us to move our legs and bend and straighten our body. 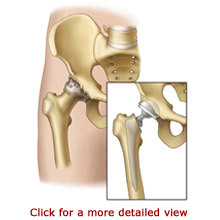 Osteoarthritis, a type of arthritis, is the main reason for Hip Replacement Surgery (Hip Arthroplasty). Other conditions, including trauma, may also cause the need for a hip replacement. 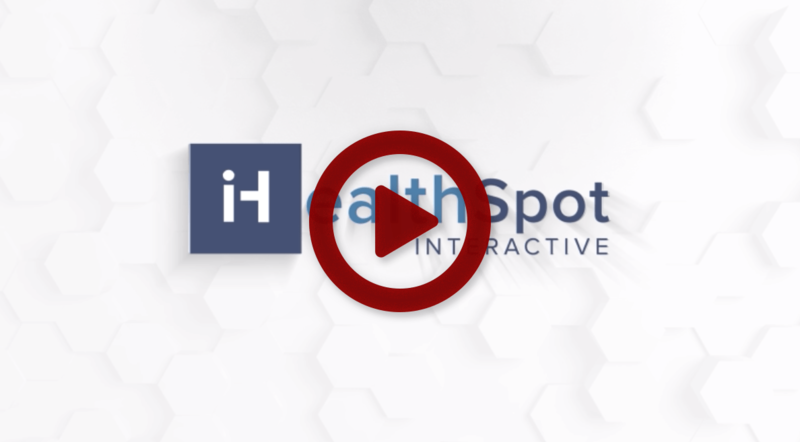 While the symptoms of hip arthritis may be tolerated with medications and lifestyle adjustments, there may come a time when surgical treatment is necessary. 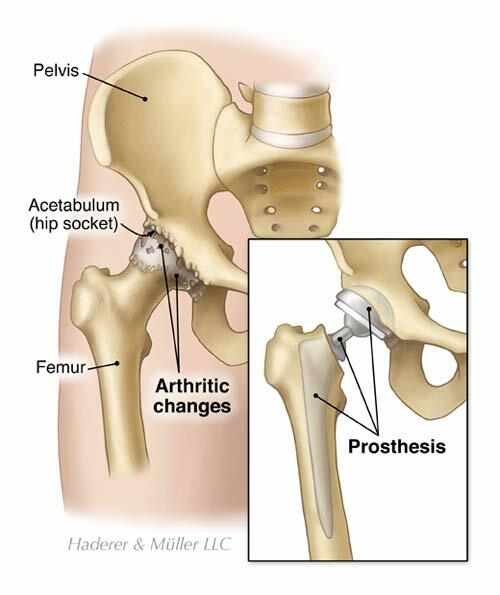 Hip Replacement Surgery, also called Hip Arthroplasty, involves removing the damaged portion of the hip and replacing it with artificial implants called prosthetics. These devices are a replacement for the natural joint and allow pain-free movement. 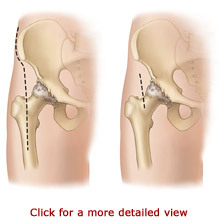 Our hip joint is a ball-in-socket joint. Our thigh bone is called the femur. The top of the femur is shaped like a ball. It is called the femoral head. Our pelvis bone has a cup-shaped socket that holds the femoral head in place and allows it to rotate during movement. The cup-shaped socket is called the acetabulum. The acetabulum and the femoral head form our hip joint. Bands of strong tissues called ligaments connect the femoral head to the acetabulum and provide stability. Osteoarthritis is the most common type of arthritis. It tends to develop as people grow older. Osteoarthritis can result from overuse of the hip during sports or work. Post-Traumatic Arthritis can develop in individuals of all ages after a hip injury, such as a fracture of the hip socket. Immediately following your surgery, physical therapists will instruct you on bed positioning to place your joint in an optimal position for healing. A V-shaped pillow may be placed between your legs to position your hip while it heals. You should sleep with a pillow between your legs for about six weeks. Your physician will temporarily restrict certain movements to prevent your artificial joint from dislocating. 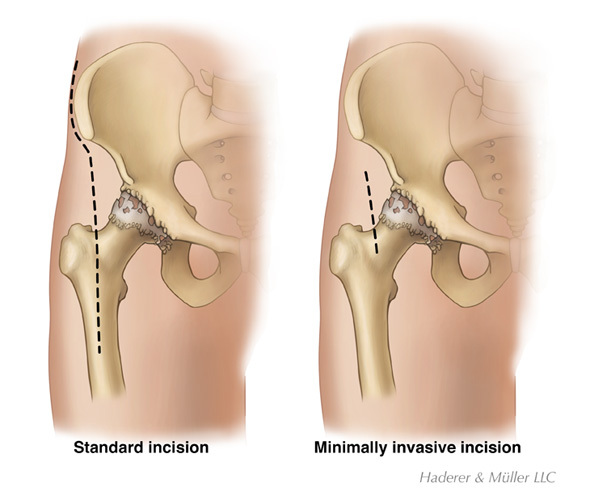 Depending on the surgical approach to your hip, you should refrain from crossing your legs, bending your hips at more than a 90-degree angle, and pointing your feet inward or outwards. Physical therapy will begin the day after your surgery. You will learn to exercise to strengthen your hip. You will need to use a walker, cane, or crutches while standing and walking. Your physical therapist will help you with walking and show you how to go up and down stairs. After you leave the hospital, you may continue with an outpatient physical therapy program or a home exercise program geared to increase your strength and endurance. When your incisions heal, you may perform physical therapy exercises in a heated therapeutic pool. The heat may help to relieve pain and stiffness, while the water provides you with support while exercising your joints. An occupational therapist can show you ways to dress and bathe within the realm of your movement restrictions. Your therapists can recommend durable medical equipment for your home, such as a raised toilet seat or a shower chair. The equipment may make it easier for you to take care of yourself as you heal and help to prevent injury. You will stay in the hospital for two to five days following your Hip Arthroplasty and you will receive pain medication to make you as comfortable as possible. The success of your surgery will depend, in part; on how well you follow your instructions during the first few weeks following surgery. You may need help from another person during the first few days at home. If you do not have family members or friends nearby, ask your doctor about possible alternative arrangements. In many cases, doctors recommend time in a rehabilitation center following the surgery. You should be able to resume light activities soon after your procedure. Total healing can take three to four months. Overall, the majority of people experience a dramatic reduction of hip pain and gain the ability to resume functional activities after Hip Arthroplasty.